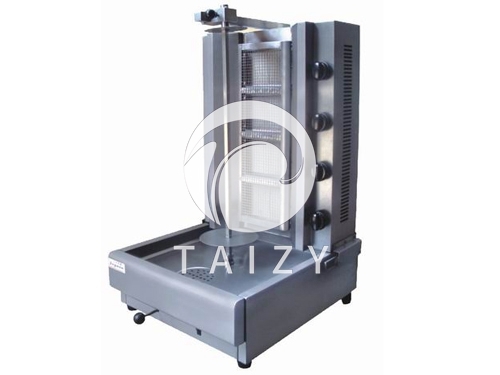 Rotary oven is designed to absorb the advantages of similar foreign products. It has novel style, reasonable structure, convenient operation, all-round display effect, fully automatic rotating barbecue, making the barbecue temperature more uniform, while infrared heat is located in the middle of food, making full use of heat source. It has the advantages of energy saving, power saving and fast heating. The bottom is equipped with an oil pan, which can make the barbecue smoke-free and has an environmental protection effect. It is suitable for barbecues in hotels, shopping malls, supermarkets, and passengers. 2. At the time of ignition, the light blue flame moves back and forth, which is a normal phenomenon. After a while, it will turn red (with a small flame), which is infrared radiant heat. 3, before grilling food, put a third of the water in the oil basin to ensure the beauty of the food burned, and there will be no fumes in the barbecue. 4, when grilling food, you can make a slight adjustment of the firepower (adjust the knob) to meet the needs of users. 5. After the work is completed, please rotate the air valve clockwise to the limited position, and cut off the power supply to ensure safety. What is a continuous carbonization furnace? Rice thresher machine-How does rice turn into rice? How to quickly cut and smash straw straw?